Last Saturday was our 10th Anniversary date. We had big plans for our 10th anniversary since we did a small honeymoon (roller coasters at Cedar Point) and have never taken a non-work related vacation together just the two of us. The dreams started with an Alaskan cruise, then it was Jamaica, then it was Colorado, then a cabin in MN, then a hotel in St. Paul. Notice how each plan gets smaller and a little bit closer to home? 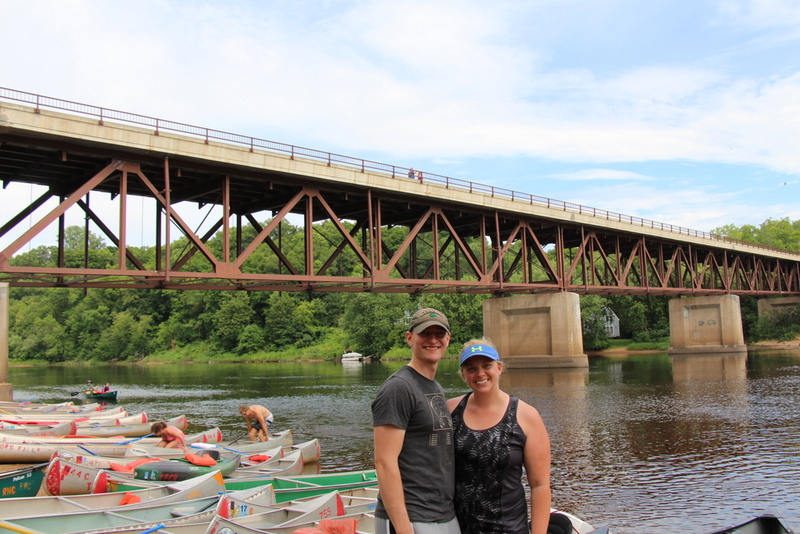 What we ended up doing was a 7 mile canoe trip down the St. Croix River. The 10th anniversary gift is aluminium, so the canoe trip, as downsized of a celebration as it was, was the perfect way to mark the occasion. We are 10 years older. We have a 10-year-old mutt, a 9-year-old son that has taught us what being a parent means, a 7-year-old son whose mischievousness keeps us on our toes, a 5-year-old daughter that couldn’t be a better example of “what goes around comes around” and a cat that we all fear. It has been an adventure. A great adventure. And it just keeps getting better. My parents have walkie-talkies at the cabin for safety. When one goes hiking alone, they take a walkie-talkie. Most of the time the other one remembers to turn on the remaining walkie-talkie. The boys see walkie talkies and think nothing of safety. It won’t be long before they are speaking in secret codes over radio waves. Add Papa and Dad driving four wheelers, and well, the boys were pretty much in heaven. These photos mostly feature Michael because I had my 50mm lens at the museum for the first time and it was a bit of a challenge. Michael was the only kiddo who would actually stay at an exhibit long enough for me to figure out how to get a semi-decent shot. As you can see from the following photos, Michael hates the Science Museum. Patrick feels the same as Michael. I know this for sure… Patrick gets more exercise running from exhibit to exhibit at the Science Museum than he ever did while he was playing soccer or t-ball. The Straight Wind Tube is one of their favorites. They love crafting little parachutes and watching them sail up the wind tube. They love it just as much when their parachute crashes. Right now it is the “Space: An Out-Of-Gravity Experience” at the Science Museum of MN. To say that Tim and the kids are excited is the understatement of the century. We will be going back soon because the kids and I bought Tim a year-long family membership for Christmas. It has proven to be one of the best gifts ever. unfortunately this year not all the Shannons could be in Grand Forks at the same time. This is the first year since I joined the family that this has happened and it was a big bummer. The kids were the ones who were most disappointed because it meant not spending time chasing their cousins. We did still manage to have a lot of fun. Michael especially had a blast. Michael would coerce anyone who would look into his big green eyes to play a round of Munchkin with him. Uncle Steve and Uncle Jon spent most of their break battling monsters of all levels with Michael. Elise spent most of her time shadowing Grandma Shannon. Every once in a while she would give Grandma a break and play in Patrick’s imaginary world. Patrick really did spend most of his time like this, sitting on the floor playing blocks. He floated from the board gamers to Grandma and Elise, but really I think he enjoyed a break from all the Christmas chaos and just had some serious chill time. It was a really relaxing and nice way to round out the Christmas break.